When I was a kid, my parents always warned me that I wasn't to speak of money outside of the house. I suppose that's good advice, except that I don't actually have any to speak of at the moment, really. If I did, it would certainly go towards a new headband from Bando. At least three of the blogs in my feed yesterday mentioned it, and I can see why. Beautiful! I love that every single item has a little piece of verse to go with it. That level of attention to detail makes me so happy. Incidentally, I finally started reading A Tree Grows in Brooklyn. I am actually a little mad at myself for not having read it earlier -- it's precisely the type of book that I adore. I'm also reading Fortress of Solitude by Jonathan Lethem; the two go together rather nicely, actually. I have an exam on Thursday, my last ever, but I just want to curl up on the couch and finish reading my books. oh man..so much eye candy at this bando site! these are really beautiful. thanks for the link. i know what you mean about wearing things on your head..though for me, certain headbands tend to make me look like a goody-goody? or something like that? i have to be very picky..
i've never read a tree grows in brookly, but i bet i would like it. i of course really love the movie, and i think about it often. have you seen it? Aren't they? I'm so glad you like the site! I just love that they're made from re-purposed materials, but don't really look it. That does sound like a nice idea -- maybe I'll start collecting pieces, and saving up my pennies! 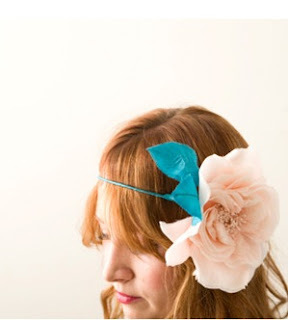 I guess the only time you can really get away with these kinds of headbands are if you're getting married... oh well! I haven't seen the movie, because I'm waiting to finish the book. You'll love the book! I love heroines that are really bookish and observant. I love head accessories too, but shy away from them. I must be a shrinking voilet too. Wonderful. I was thinking about making my own headband creations a while ago and after looking at these think i am going to have to give it a go. 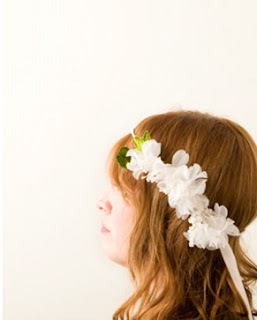 There is one headband that is so lovely it makes me wish I were getting married so that I had an occasion to wear it. Although, a 30th birthday also seems like a fit occasion! The styling and photography at the ban.do site is just perfect. Oh these headbands are so beautiful and I love that them come with haikus. Unfortunately, I learned at a young age they look terrible on my long slender face. The unfairness of it all! Can I live vicariously through you and your leather headband? I have been meaning to write you for a long time to tell you, Congratulations on finishing your degree!! I'm so proud of you. What an accomplishment! I'm glad you all like them! And yes, I think whimsy is a perfect way to celebrate a 30th birthday (or a wedding! ).